So, the poodle was a real part of the design ?!? 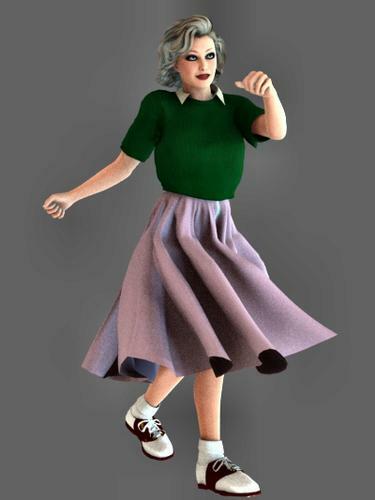 I went through elementary, junior high and senior high during the '50s and I can assure you that -- particularly around '56-'58 or so -- Poodle skirts and saddle shoes were quite common - at least in northern Virginia. I'm really bummed right now because Daz closed up shop for the weekend without addressing my inability to access platinum club sale prices or the members only forum. We're looking at a hurricane hovering over us from late Sunday to Wednesday, with expected wide-spread power outages, so it looks like I'll be shut out of all of the closing events of the 10th anniversary sale. I have everything I need in my cart to finish the Buy It All category, but I'm sure not going to pay full price for it, so barring some miracle, I guess I won't get the buy it all bonus, either. I can only hope they'll take pity on us and extend the sale. Or the hurricane turns out to sea. If you can afford to pay up front, Sales would refund the difference. They could put it back to the payment source, if you need that. You might take a screenshot, and we could tell you the price for each one. I also had the dumb idea of sending a screenshot, and getting credit before purchase, but they probably wouldn't do that. CS are very helpful, if a bit stressed out at the mo. File a ticket, explaining your predicament, and then we can pass it on, first thing Monday., if you post the ticket number here, or send it to one of the Forum Team by PM. Yeah. Speaking as a former customer support person (for a telecom company, not DAZ), my protip to people is "be polite, people at the other end are people too" and "politeness yields better results and better motivation". Seriously, Customer Support at DAZ is very nice and competent, even if sometimes you may have to explain something at length, if things get complex. I used to be front-line tech support for a telecom company -- small world! I got yelled at a lot -- much as I understood our customer's frustrations, the calm ones got helped faster because I didn't have to calm them down first (yes, we were required to do that -- you can't get a coherent trouble report from someone who's screaming or swearing every other word, no matter how creatively). Key things were maintaining a sympathetic, helpful, and above-all professional demeanor at all times (and all costs -- there was some head-desking involved), and not taking the customer's behavior or complaints personally (seriously, yes -- personally, no). I'm happy to say that everyone on DAZ's sales support staff I've interacted with has embodied these principles to the hilt. Thanks for all of the suggestions and comiseration re my hurricane dilemma. Support tickets updated and everything is in my cart, so hopefully, things will get fixed on Mon or Tues and during a lull in the storm I'll be able to pay for the order via cell phone. Meanwhile, I'll think some more about buying it now--although I hate to spend $250 and ask for a $175 refund...Wow. It is a great sale, isn't it? If this is the worst that happens in the next four days, I will definitely count my blessings. Besides, I was in the first batch of Lucky Ducks AND my neighbor, who has a generator, says I can recharge my laptops over there anytime. So I should just stop my whining already and go out and enjoy the fringes of the storm rolling in. As a big Amen to that, I have to say that just about the ONLY reason I'm still in the Platinum Club at this point is the sterling service that Brittany and the other customer service folks have been doing. I've lost track of all the ridiculous things that have happened since the new store went on line, including being booted out of the PC six times, multiple double billings and, most recently, "phantom" bills that show up in my Daz account but apparently don't really exist, but Customer Service has managed to sort everything out so far. They really have been doing an extraordinary job in the most trying of circumstances. It seems the shop is down again tonight, have been trying (painfully) to add a couple stuff in my cart, but then I can't do anything with my cart :roll: ... Hoping they fix it tomorrow. This is an old "poodle skirt" set that I bought at Poser Pros before they closed. It was for V3 but has converted up to V4. It doesn't go over to Genesis well. There's a real problem with longer skirts. I am in the middle of "Sandy" and this is the first time I have been able to get online and stay on. The power comes and goes so my wifi is in the same boat. Good luck I know I have repairs to do here when it clears, either that or I will be using buckets as decorations. Genesis can be Decimated as well, any mesh figure can as far as I know, but Genesis already has a Base resolution which makes it about 19k, which is about a quarter of normal figures like V4 and M4, so that should help anyway. Maybe not so good for close-ups. Can it be posed after decimation? Yes it can be posed and even textured. Decimation can spoil the facial features depending on how much you use. I would think it woukld be best used for distance shots. There's times you want distant background folk. And you could even do animation with them. Be sure to first adjust the node weighting by clicking on the weighting subtab after hitting the Prepare to Decimate Button, then go back to Resolutions tab to get your desired results. Works darn well! I loged out closed my window opened it went back to my cart & it still shows 99.95 refresh it, went ahead as to check out but it stayed as 99.95 not 69.95. Were you a recent PC member and trying to renew your annual membership? If so, you might need to contact support. If you are just now trying to join though or your membership expired sometime back, the actual price is the $99.5 to buy the membership. The $69.95 price is for renewing your membership if you are already a member. I'm waiting for the same fix. But I think we're supposed to pay the full amount then request a refund of the difference. However, there is also apparently a problem where getting a refund (on anything!) borks up one's PC membership so what the results might be is anybody's guess. As atryeu says, if it is a simple renewal and you get charged to full price, file a support ticket, and you will be refunded the extra money. I am already a member but I pay each Month for a long time now. And I still won't do this — it is not acceptable to me. If DAZ won't (or can't) fix something as simple as this, they're not getting my money. ITA Don't think I even have the over 100.00 with the plus tax, to wait for them to give me my money back or store credit when I need my money. I agree, the poodle skirts didn't really take off over here as they did on the other side of the pond, although they were around.. Full gathered shirts, knee length or just below and "shirtwaisters" are what I remember my Mother wearing here in the UK. I canceled my platinum club subscription yesterday because of this issue. It was due to renew today, but I had no idea what card they would charge or how much they would take. I think I paid with gift certificates last year but they listed a credit card (with a number that did not match any card I currently have) in the subscription details. Since the cancellation took effect immediately, I guess I'll miss out on any end of celebration events. Strictly speaking: -How- difficult would it be to make an annual renewal product that's a DO exempt from vouchers (like the new extravaganzas)? That'd be full price for non-subscribers and 30% off for PC subscribers. During the PC sale, it'd even have had an additional 10% off incentive with our increased discounts for the month. Honestly, it looks like the mechanics for it are already in place, even in the new store. Even if we had to go and purchase it manually it'd still be a sight better than the whole fooferaw going on now. Plus, it'd have at least -some- incentive for annual renewal during the PC sale. People would grumble but not near so much as they are now. 180 pages at the moment...so roughly 9,000 PC members. And that doesn't include those who might be PC members but are labeled otherwise by the forum (PAs, Community Volunteers, etc.) Puts things into perspective, given how few of us are active on the forum (only 56 PC members have 250 or more posts). Wish I knew how many there were at the time of the site changeover, but it seems like the club is doing fine as far as numbers are concerned. The forum list now reports 244 pages of Platinum Club members (roughly 12,200 members in total). Looks like membership expanded significantly during the sale (assuming the Member List is accurate). They have one, or did... There was the one for New Annual and one for Annual Renewal. I thought they were both still in the store. I've used the renewal one for the last 2-3 years when I renewed without problems (the last time was last March, before the site "upgrade"), and you did have to do it manually. They've never had automatic renewal on the annual memberships. couple of things. 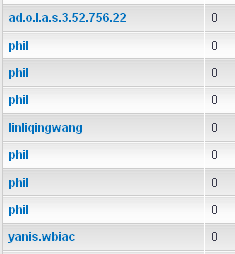 There are a lot of phil's in that list. Second, just because someone doesn't post doesn't mean they didn't join the plat club. You can join the club, save money and avoid the forums. Or lurk them. When I first joined the site I rarely ever posted at all, and when I joined the PC it was the same. I posted now and then, but up until just this last year, for 8+ years at Daz (almost 6 which were with the PC) my post count was barely 200-300. That was my point -- six phils almost in a row? Doesn't really look like six different people joining up, does it?